This beach inspired Christmas mantel shimmers and shines with silver and glass, celebrating family memories from the shore. 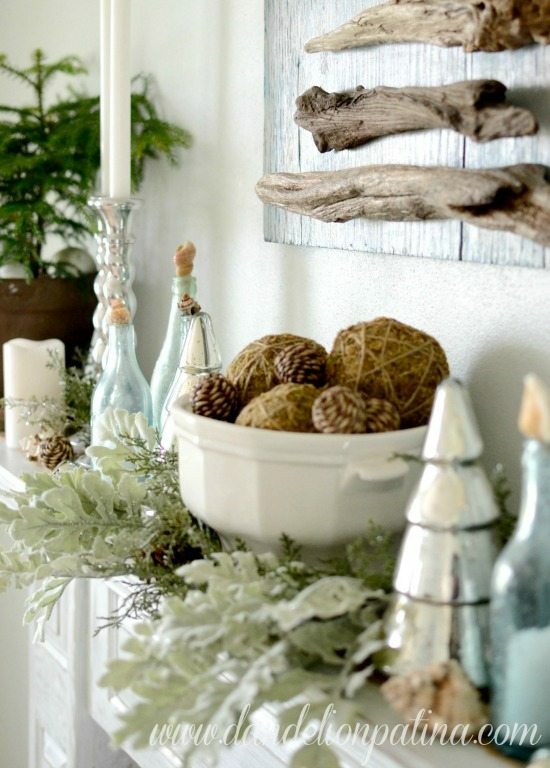 If spending time at the beach is one of your favorite activities then a Beach Mantel is not just for the summer. At Christmas, Michelle and her family celebrate life, sharing distinctive memories about the past year. Such as, treasures found on the shoreline. 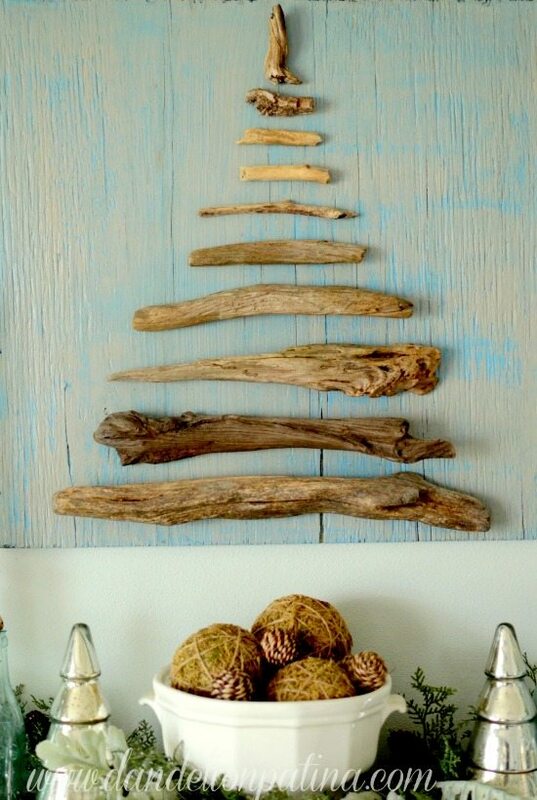 The fabulous driftwood wall tree is handmade from pieces collected during family outings, and collected shells act as stoppers on Vintage Glass Bottles. The silver tray table is a lovely piece that’s filled with Seaglass and Christmas ball ornaments. Other Christmas Decorations that shimmer and shine, Mercury Glass Trees (or check out Pottery Barn’s) and Swirled Silver Candlesticks. Everything is gorgeous, with a beach as well as a winter vibe, fitting for a home located in the Midwest. And in the spirit of natural simplicity, Gifts are Wrapped with Twine. 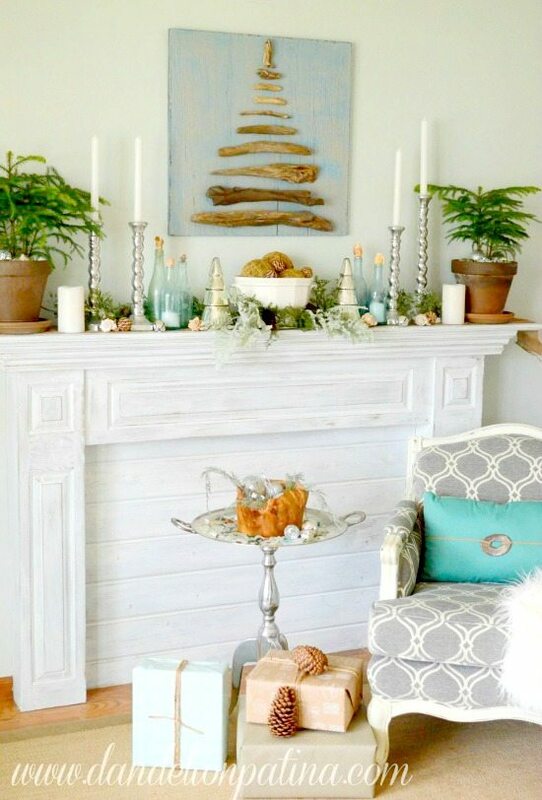 To read and see more of this beautiful beach mantel, head over to Michelle’s blog Dandelion Patina. There you will also find the link to the driftwood tree tutorial. 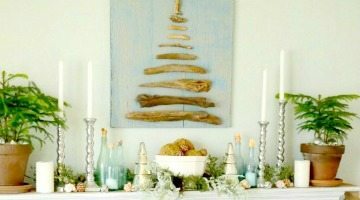 Thank you so much for featuring my Beach Christmas Mantel.. Happy Holidays.